Digital Scholarship@UNLV is a service of the UNLV University Libraries for the faculty and students of UNLV. The mission is to capture, preserve, and share the intellectual output of UNLV faculty, staff, students, and collaborations with other stakeholders. Research and scholarly archived output includes: articles, monographs, audio/visual presentations, working papers, technical reports, conference papers/posters, theses/dissertations, data sets, and publicly-funded research. The UNLV Libraries repository uses bepress Digital Commons software. It is organized by communities (divisions, research centers, publications, etc.) and collections that represent a variety of scholarly materials. If you are interested in starting up a community, collection, or creating/moving a traditionally-published journal to open access, please contact us at digitalscholarship@unlv.edu. UNLV faculty may have been hearing about the UNLV Bibliography, a new service of the University Libraries. Learn more about the bibliography including how to ensure your works are being included on our UNLV Bibliography Guide. Digital Scholarship@UNLV provides contributors of full-text content with monthly reports on the use of their works. Additionally, authors receive access to an author dashboard. The dashboard provides information on how many downloads the documents have received and where those downloads are occurring. In order to fully take advantage of this download and reach information, full-text is required. More information is available at "How Can I Submit Full-Text Works." 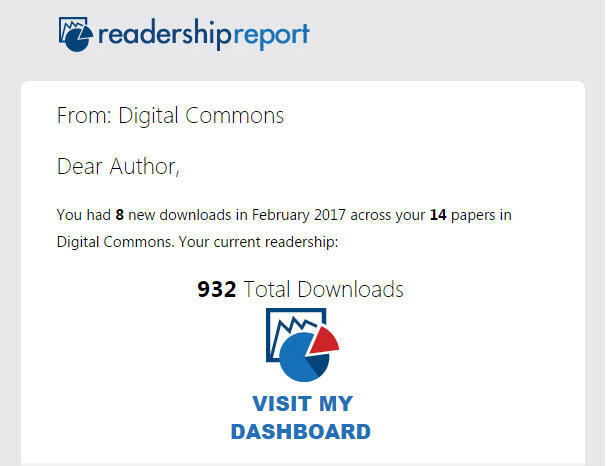 The author dashboard provides contributors with a variety of tools to help gauge impact and reach of their works included in Digital Scholarship@UNLV. This information provides a supplement to traditional citations, and along with altmetrics badges, gives additional insight into where and how often the world is discovering your research. One of the first things you’ll see when you get to your dashboard is a map of downloads. 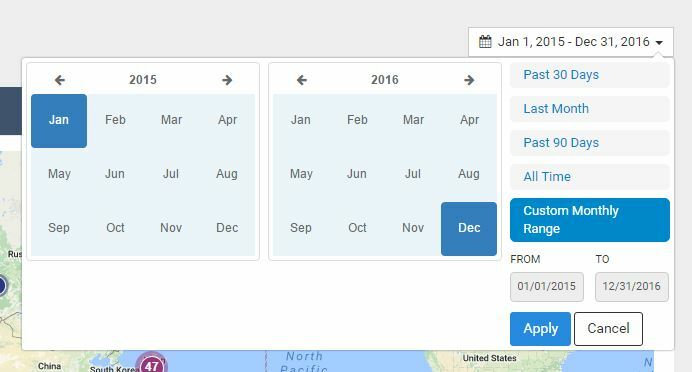 Authors can add a date filter to select the timeframe of data to show, such as for an annual report. Additional views of the data include downloads by country and works sorted by download.